Neutrogena generally has some fairly spiffy skincare products. However, I did not like the Neutrogena Healthy Skin Glow Sheers Liquid was not impressive to say the least. This week I read Ricebunny’s foundation review (and watched, i guess) and she seemed to have the same opinion I did. I pretty much have the same opinion. My pores looked huge, was not good for blending, hard to match my skin-tone… etc. I hated the streakiness, I appeared slightly sick with the yellowishness. I don’t like it. It doesn’t fulfill the proper task of what foundation is meant for. I had to go on skin rehab… lets just leave it at that. This is my daily eyeliner. Is pretty good. Its a good pencil eyeliner. I like the buffer at one of the ends. However, my one complaint is that it doesn’t stay sharp and that you can’t really sharpen it easily. 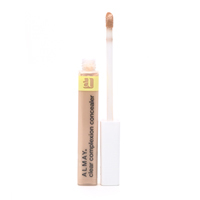 My favorite concealer is Almay Clear Complexion Concealer. I like how it conceals my blemishes and dark circles without making me look all caky and fake. I suggest this concealer for you to use too. Use a Lash Comb. These are helpful gadgets. They separate lashes and remove extra unwanted globs of mascara. How do you uses a Lash Comb? Take the brush and run it through your lashes before you apply mascara. Then apply the mascara. Now, you want to take the comb and brush it through your lashes again. This step defines lashes even more. Sweep your eyelash comb through your lashes while they are still wet. If you want, you could save your mascara wands from previous mascara kits and clean them. They work too. Try Colored Mascara every once and a while. Black mascara works for everyone, but it can appear harsh on blondes. Blondes should use brown/black in the day and save jet black for fancy nights out. Blue mascara can make blue or grey eyes pop. Purple can make brown or grey eyes pop. Also, green mascara can make green and brown eyes pop. Clear mascara gives a more natural look and can be worn with any eye color. When Applying Mascara, put the wand near the base of the lashes and wiggle them. After you do that, move the wand upwards. Barely touch the tips of your lashes a couple of times giving the appearance of longer lashes. Thin and Little Brushes tend to work best. Thinner brushes allow you to get the lashes near the nose and on the other end easily. Little brushes overall are easier to control. Blink onto your brush. Blinking onto your brush give your lashes a fabulous extra coat. Curl Your Eyelashes. Curling your eyelashes makes your eyes appear brighter, bigger and more sparkly and your lashes longer. How do I curl my lashes? Get an eyelash curler. Put it at the base of your lashes and squeeze for 10-20 seconds. Set it in the middle of lashes and squeeze for 10-20 seconds. Place at the tips and do the same. How can i get the curls to stay? Take your blow dryer and blow hot air onto your curler for 5-10 seconds. Go through the same steps as before. Apply Powder Below Your Eyes Before Putting On Mascara. The extra bits of the mascara will fall onto the powder. Its easier to remove a tone of powder than a bit of mascara on oily things like foundation, consealer and blush. ZigZag The Mascara Applicator. By doing this it sepparates lashes and you will have fewer clumps. Apply Mascara to both top and bottom sets of lashes. This creates an allusion of bigger and wider eyes. Only apply one coat to the bottom lashes. NEVER Pump the Mascara Tube. Puping the Mascara tube will dry out the mascara! If you need more mascara on the wand twist instead of pumping. If You Apply A Second Coat Do It Before the First Coast dries. If you apply mascara again after the first coat dries than they will get clumpy. A Smudge Proof Tip — Bend your brush at a Right Angle. This can work wonders if you’re good at apply mascara this way. I am not good at applying mascara this way and it didn’t look so great. Use Mascara Primer. Make up Artists often sware by this. It works great but it also adds another step. After You Are Done With Applying Your Mascara Wait 5 Seconds Before Blinking. Blinkig could smudge it! NEVER Curl Eyelashes After Applying Mascara. The curler could stick to your eyelashes and possibly rip them out. Personally, I think it looks more natural if you curl them before applying mascara too. Washing your face is an important step. Your make up will look better on a clean face. As equally important you should moisturize your face. Make sure that you moisturize 20 minutes before applying the rest of your make up or else your make up will seep into your skin with the moisturizer which could result in nasty breakouts. Tip: If you apply shimering moisturizer your face will have a nice glow even after you have applied your make up. Make sure your foundations matches your skin perfectly! If it doesn’t then it will make you look like you’re wearing a mask. There are different kinds of foundations out there: powder, liquid creme etc. It is best yo choose the one that is most comfortable to you. Tip: If you tend to have dryer skin it would be best to use liquid foundation. Whereas, if you have oily skin it is best to use powder foundation. Again, make sure you find the right shade of pink to match your skin tone. Blush also comes in liquids, powders and cremes. To apply it, smile and put onto you cheeck bones. Tip: Finding the right shade of blush can be extremely hard. Pinch your cheeckbones. The pinky/red color that will show up onto your skin is the shade of blush that you should look for. Tip: Hold a business card (or something similar) below your eyes while applying the eye make up so hat you do not smudge or glop up our other make up. Hold it above your eyes while you apply mascara so you don’t mess up your eye shadow. Choose a shade that compliments your make up and skin tones. Apply to your lips. Tip: Red lipstick make your teeth look whiter. Experiment with lip colors that look best with your skin tones. If you have trouble, try visiting a make up specialist that can help you. Have you ever peard at photos of your favorite celebreties and wondered how they made their eye make-up appear smokey? Well, I have too! So I ventured out to cyber space researching “how to make smokey eyes”. Trust me, you won’t finish your search empty handed. My favorite tutorial was done by another blogger RiceBunny. Here is a link to the page of her tutorial. Keep in mind that there a many techniques and ways to get smokey eyes. This is just my favorite.